Hasbro "Photo real" Edition 2005. Marketed under Hasbro's MB Games arm, this is the latest attempt of a new mass-market Subbuteo set. It was launched early in 2005, to avoid the launch being lost in the Christmas rush of 2004. Even then, it was a fairly low key launch. The set (and training packs) were initially supplied only to Toys-R-Us but, as I understand it, their exclusive ran out in July, and the sets have arrived in many other stores as Christmas 2005 rushes upon us. Sightings of the set include the Woolworths catalogue (although I've only seen the set in larger stores), the Argos catalogue, JD Williams mail order, and Wilkinson stores. Wilkinsons also had the training packs. Obviously, the set can be found at many internet sites too. The set was priced at £29.99, and the training packs were £4.99 each. This page gives an overview of the new products, and some waffle about reaction in the table soccer community. Spring 2010: Additional photo-real Subbuteo sets and players packs were added to the range between 2005 and 2007, and then it disappeared as quietly as it came. As this version of the game is no longer current, I have summarised the whole output on a photo-real page. For this reason, I have removed the details of the extra packs from this page, but I have left the original "focus" on the website as it adds more detail (and waffle) than could be fitted onto the new page. The new set has been produced in an attractive dark green box, with a very prominent Subbuteo logo. The logo continues the red and silver look of recent times, but the oval now encloses an image of a Subbuteo figure in a circle. This is the new "small logo", used on the balls and player bases. As with Parodi's set, the lid has a picture of a football match with no identifiable players or kit, although obviously a quick glance with suggest both David Beckham and England. Again, this highlights the problem of licensing that Subbuteo has to face in the 21st Century, which would probably make the full team range of yesteryear impossible. The front of the box also has the badges of all the teams involved, and makes it clear that player selection is random. The sides of the box simply feature all the logos from the front. The back has a large picture of a match in progress, a smaller picture showing the "3D architecture", a small advertising blurb, and a contents list. Once the cellophane is removed, you find the accessories taped carefully into a card support, with the pitch stored underneath. Open the box, and you will find the following items (and I've matched this to the Focus on Parodi's 2003 set for comparisons). These are white, and have the new small logo printed on them in red. They are a thick plastic, and the grooves for the harlequin pattern are probably too deep for true accuracy. However, overall they are okay. The set had white balls with a red logo. The other balls here come from the skills packs, and the Urban Edition (red ball). The goal is all new, but is similar to both the mid 1990s Hasbro goal that was borrowed from Pro Action Football, and the old tournament goals. It has thick round posts and bar, and a deep loose net that should hold shots within the goal (always useful). The net is already fitted (using cotton loops), which is a plus. However, there are two serious downsides. The key one is the back bar, under which the goalkeeper rod is placed. These were often too low on Hasbro goals, but these are the lowest yet. There is no way to raise the goalkeeper to save a chip shot. Surely goalkeepers can jump? You are even conscious of the friction caused by the bar when moving the 'keeper about. Very poor. The second problem is that there is no way to hold the goal down. Previous Hasbro goals had clips that slid under the pitch, but these do not even have screw holes. With the goalkeeper pushing against the restraining bar, it is hard to keep the goal stationary. This is simply a large fold-out sheet. The rules are explained in bite-sized chunks, and are fairly similar to previous editions of the game. The game features defending flicks, but if these hit a player or the ball, it's a foul and a free-kick, rather than the "back" as played in modern table soccer. I can't find any details on what an attacking player has to do to cause a free kick (beyond touching the ball with his hand, or mis-flicking). The old offence of touching an opponents figure before hitting the ball (or just hitting an opponents figure) is not mentioned. The offside law has also been altered, but not too clearly. Basically a player is offside if he is beyond the last defender when the ball is passed to him (in the opponents half). However, when the defender calls "offside", this doesn't result in a free-kick but instead the on-side flicks are taken. Only if players are offside after two onside flicks (and two defending flicks) is the free kick awarded. It is only a player receiving a pass that can be offside (I guess any others are not interfering). And there is no offside from corners thankfully (table soccer rules on this are somewhat annoying). The Pitch and the "Stadium". The first thing you will notice about the new pitch are the white plastic corner pieces. These are actually fixed to the pitch making it rather a bulky item. The little design touches on these corners are rather pleasing though. Each corner houses a ball socket, from which long plastic tubes rise up above the pitch. A further connector joins these tubes above the centre circle, and a scoreboard, plugged into the bottom of the connector, completes the stadium look. The idea behind this contraption (beyond the aesthetics), seems to be to hold the pitch in tension to provide the flat surface crucial to good play. This does work to an extent, but the pitch (a similar material to the Parodi one) is still prone to creasing, and the stadium does nothing to alleviate this. The most obvious question about the new design is "does it interfere with play?". The answer, unsurprisingly is yes, but not as much as you might fear. When using it, I had to decide whether to play over or under the tubes when standing on the wing. I haven't tested it on the floor (too old for that!) or with kids, and it might be better for them. Here we reach the key change to the game. 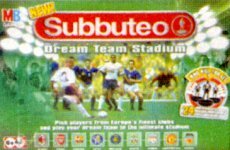 This version of Subbuteo does not feature full teams as such, but individual players. These players are in their club strips, but you do not field a whole team from the same club (unless you want to and have collected enough extra players to do so). Instead, the bases (red or blue) determine which players are playing for which team. The box set contains 24 players, which is enough for both players to have a complete team (including a super sub). The rules do not seem to explain how you stop fights between youngsters over which players to include. I suggest you line all the players up and pick one-by-one like its a game at school (oh, the horror of being picked last). The players themselves are one of the strong points of the redesign. The figures are about the same high as the old flat figures of the 1950s. but are both wider and thicker, making a more robust playing piece. The kits are crisp at this size, and everything looks good from a playing distance. The mid-season February 2005 launch does bring the usual problem of ever changing teams and players. It is inevitable that some players left these clubs in the summer. In addition, some kits have changed slightly, although all these teams play in such distinct colours that it does not matter all that much. The most awkward change is Arsenal's one-season switch to "redcurrant", which would have made a striking figure, and is sadly absent. Each player's name and squad number is printed on the back. This is slightly larger than life size, and again works well. The body of each player is essential the same, with a barrel-chested, clenched fist pose. Close inspection reveals small variations to the creases on the shorts, but the shirts seem the same for every player in each club. The heads of the real players have been super-imposed onto these standard bodies. At this size, some players are very recognisable e.g. Freddie Ljungberg or John Terry (above). Others are much less so e.g. Milan Baros (above) or Joe Cole. This is obviously dependent on the photos. In fact, look too closely, and some players do start to look a little comic, as their heads can seem the wrong size for their bodies. In some cases this is unavoidable, as the same physic is not going to suit every player. Only the front of the heads are unique, with standard hair cuts on the back in a range of lengths (Japp Stam has no hair, whilst Aimar of Valencia has lots!). 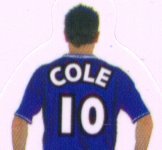 This can be amusing (Joe Cole loses his highlights), but again looks fine from the intended distance. If the players are the most successful part of this version, then the bases are arguably the worst. Like all Hasbro bases, these are solid plastic and therefore not weighted. The shape is probably best described as a 1950s base scaled up to 1970s heavyweight size. Certainly the top of the base matches the diametre of the heavyweight, but the bases are much higher giving a more steep sided effect. The bottom of the base features the new Subbuteo logo, which looks fine from a simple design point of view, but completely undermines the "polish and glide" technique used by modern table football players. The higher bases make it much harder to chip the ball because the base hits so high up the ball (it's a smaller ball than the 1950s). This also seems to affect the strength of shot, and power is hard to generate. The positive side of the bases is the return of swerve to the game. Serious table football has gone down the route of low, flat bases and the result has been improvements in long range flicking, chipping and importantly touch, as a player slows down gently to the ball without over-balancing. This has been at the expense of swerve as the curved sides of the base have been whittled away to nothing. In serious tournament play, this is a logical trade-off. Swerves are often high risk, and touch is vital. However, as a kid, a swerve was always the most entertaining move. It is so satisfying to spin around a blocking player and just glance the ball with the player's head. Or to spin around the ball to change direction. Old time players have commented that sadly the new figures are not as reliable with spin as the old 1950s flats. I can't dispute that, so even here the bases are not as good as a previous version. However, the old moves are possible and I find myself grinning when I pull them off. The best comparison I can make is that these figures play like a larger version of a 1950s Newfooty figure. The weight is concentrated in the base and so the figures do not fall over very often. There is a tremendous amount of swerve available, but flicking any distance in a straight line is next to impossible. In going for a retro 1950s feel, Hasbro have chosen to completely ignore the advances in table soccer made in the last fifteen years or so, and I think this is what has frustrated the playing community. One card from each team features a goalkeeper figure In my experience, these figures turn up in the full edition (where you get two) and in the goalkeeper training pack (see below). Although the figures cards are random in the sets, it is obvious that Hasbro made sure there are two goalkeeper cards in each set. The goalkeeper is obviously the same scale as the outfield players, and because he has his hands over his head, he is a much taller card. The 'keeper's base is smaller and lower than the outfield ones, and is in fact, smaller than the green handled OO scale bases. Despite this, he is still the biggest official Subbuteo goalkeeper to date. With the difficulty in chipping the ball, it isn't going to be very easy to score. The rod is green as before, but has a more elaborate handle that seems much more uncomfortable. A case of being over designed, or an attempt to make the rod "flickable"? New Subbuteo and the Table Soccer Community. 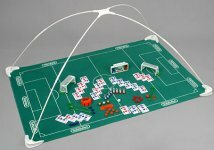 The new product received a lot of criticism from the table soccer community, most notably from existing players. Worryingly for Hasbro, the moans have been chiefly about playability. In the absence of Subbuteo products over the last five years, the community have been free to experiment and to find improved designs for bases to aid play. This has resulted in heavier bases (to aid shooting), lower profiles (to aid chipping) and a large flat base (to give long accurate glides and softer touch when reaching the ball. The new Subbuteo has none of these things. Comments have also been made about how cheap the product looks. A majority of collectors also feel ignored. Okay, you can buy the training packs to build up teams, but I'm not sure too many adults will feel the need to do so. Manufacturers of other long established toys like diecast vehicles, Scalextric, and action figures, appreciate that a reasonable proportion of their sales go to older collectors who buy for attractiveness, nostalgia or even for possible investment value. Subbuteo certainly had room to go down this route with limited edition teams or accessories (UEFA Cup anyone?). The brutal truth is that this game is not aimed at the small band of serious tournament players, or even the dedicated collectors. Both these groups probably only number in the hundreds, and Hasbro as a big toy company need bigger numbers than that. This is very much "one for the kids" and the hope for older table soccer players must be that some of these kids get interested enough in table soccer to progress to the mature game. So will kids play it? It is usually suggested that computer games have killed the market for Subbuteo. I think this is an almost insulting generalization. I'm 36-years old, and have played computer games since I was twelve. These things are not exactly new. I've been addicted to many computer games down the years, and enjoy football sims as much as anyone. But not to the exclusion of plenty of other hobbies. Not convinced? Two words - Games Workshop. Games Workshop are based in Nottingham, and are the biggest company in their field in the world. What they do basically, is sell war games. The big sellers being Warhammer fantasy, Warhammer 40K, and a Lord of the Rings game. These might be sci-fi and fantasy but the trappings are very traditional. The troops have to be painted, and the vehicles are assembled from plastic kits. There are dice to roll, and tables to check. If you fought World War II across your bedroom floor with Airfix as a youngster, you are not going to have any difficulty playing Warhammer. Games Workshop quite ruthlessly aim their models at the teenage market, and know that they have to keep enticing the next generation. Although there is perhaps less aimed at the older gamer, many remain active and there is still a fan base among those who played in the 1980s. Certainly Games Workshop are successful enough to have a chain of shops which just sell their products, and a monthly magazine (White Dwarf), and not a computer in sight. Both table soccer and wargaming survive because of a number of factors. All important is playability. They have rules that are easy to pick up, but tactics and skills that take longer to acquire. You want to get better. In this respect, they do clash with computer games. Another aspect they share with computers is the ability to compete with your friends and other players worldwide. Computer games improve in this regard with each new generation of hardware. However, where computers cannot compete is the physical aspect. The simple appeal of items you can touch. Scale models have always been attractive to kids (and adults). Even in the 21st Century, the kids that do come along to table soccer tournaments, or to club events often get hooked. Humans do not change all that much. I'm not convinced that the new set is really the right product for the job, but any mass-market Subbuteo product is better than no product. It will hopefully prove successful, and allow a new generation of youngsters to enjoy what is still a great game.